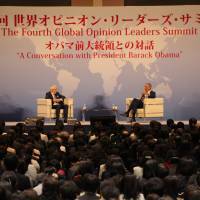 Worldwide Support for Development (WSD), a nonprofit philanthropic organization that holds a variety of summit meetings on global welfare, held the fourth Global Opinion Leaders Summit, at which former U.S. President Barack Obama spoke about denuclearization and world peace, in Tokyo on March 25. The summit's speakers were Obama, WSD Chairman Haruhisa Handa, former New Zealand Prime Minister John Key and WSD Honorary Advisor Brendan Scannell, who is also the former Irish ambassador to Japan. The event was livestreamed by the Associated Press and Reuters. The audience was comprised of around 2,200 attendees, many of whom had seen the WSD's advertisements and applied for seats. Japan marks the last leg of the former president's four-country Asia tour that took him to Singapore, New Zealand and Australia. 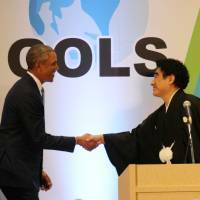 This was Obama's first visit to Japan since his historic 2016 trip when he became the first and only sitting U.S. president to visit Hiroshima, paying tribute to the victims of the World War II atomic bombing and their families. "I am very much honored to invite former President Barack Obama to Japan for the first time since he finished his second term," Handa said at the beginning of the summit. 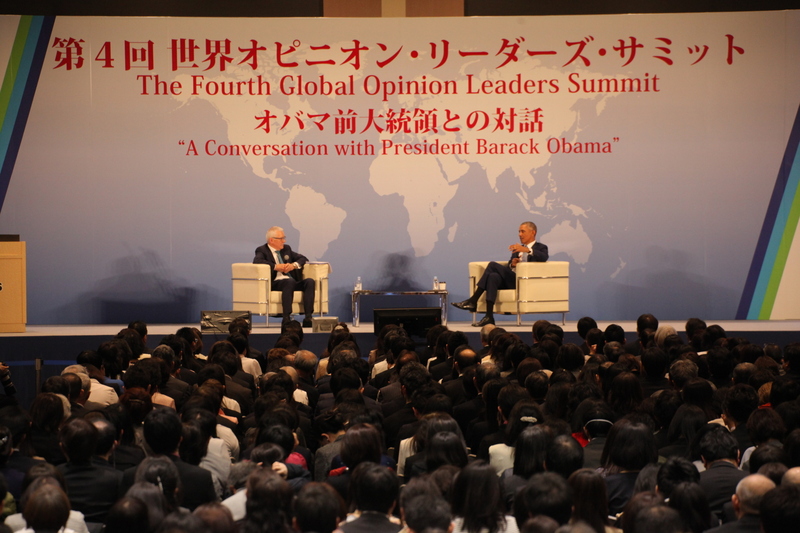 In a dialogue between Obama and Scannell, the former U.S. president spoke of his Hiroshima visit, North Korea, his idealism regarding denuclearization, the environment, Brexit and his experience as president. "North Korea is a real threat," Obama said. "Our view has always been that we would prefer to resolve these issues peacefully. … The country continues nuclear development and will conduct more nuclear experiments." Obama was awarded the Nobel Peace Prize in 2009 "for his extraordinary efforts to strengthen international diplomacy and cooperation between peoples," according to the Norwegian Nobel Committee; earlier that same year, he gave a speech in Prague where he urged world leaders to work toward creating a nuclear arms-free world. Although controversy remains over whether Obama deserved the award nine months into his first term, while leading a nation at war, his hope to mend bonds at Hiroshima had been a long-term goal. The former president had been considering the visit for a long time, sharing that it was one of his biggest missions when he became president. When speaking on his experiences as president, he said he enjoyed being surrounded by young people whose selfless and innovative minds strove to make the world a better place. Meanwhile, he said that it is older generations who created most of the problems the world currently suffers from, adding that they tend to not want to give up their power, but the time will come for them to relinquish it. 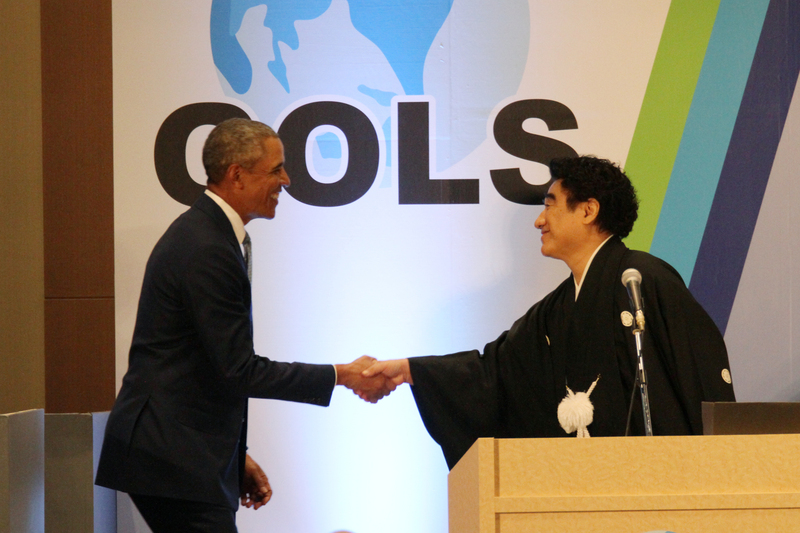 Handa said Key was instrumental in making the summit a reality, as he was the first person to ask Obama to join the summit as part of Obama's Asia tour. WSD invites prominent political leaders to the Global Opinion Leaders summits. Past attendees include former British Prime Minister Tony Blair at the first summit in September 2013; former U.S. President Bill Clinton at the second summit later that year in November; and Blair, former Australian Prime Minister John Howard and former Philippine President Fidel Ramos for the October 2014 summit. Besides holding symposiums on world welfare, WSD is engaged in philanthropic activities, such as raising funds for humanitarian aid in Cambodia, Laos and other developing countries. Besides being WSD chairman, Handa wears many hats. He is behind the promotion of various sports, especially golf, as the chairman of the International Sports Promotion Society (ISPS). Handa also founded the Japan Blind Golf Association, the first such club in Japan, in 1988, and is known as "the father of blind golf in Japan." The ISPS regularly sponsors blind golf tournaments. In addition to his work with the ISPS, Handa is also the chairman of the International Foundation for Arts and Culture, which has held international concerts in Tokyo featuring famous singers and musicians such as David Foster, former Chicago vocalist Peter Cetera and many others, including several Grammy Award winners. He is also the chairman of the Tokyo Art Foundation, which organizes various concerts and plays.